In western culture the ego has had a bad rap. Most people think that an ego is something negative. That it should be suppressed. You have an over inflated ego, or you are egocentric or egotistical. But what is the ego? Is it something good or bad? Should you give up on it or hold on to it? In both analytical psychology (Jungian) and psychoanalysis (Freudian), the Ego plays an important part in the development of a healthy psyche. Without the Ego, there is no central point, or driver of the psyche. In Freud’s model of the psyche, there are 3 main psychic “apparatus”, namely the Id, the Ego and the Superego. The Id is instinctive and will pursue all the things you want and want to do, whilst the Superego is your conscience and its goal is everything that you should be doing. Somewhere in the middle of these two drives is the Ego, who needs to find the balance between what you want to do and what you should be doing. A very good analogy to the Freudian concept of Ego is found in the Lord of the Rings saga, where Samwell (Frodo’s best friend) performs the function of the Ego in his role. He is the quiet, strong one, not heroic, but realistic. He plods along, being practical and supportive and unwavering in his commitment to the goal. Ultimately Freud’s’ Ego acts according to the Reality principle. It is the Ego which determines whether your fantasies, dreams and desires are realistic and if you are able to achieve them. The Ego will then assume the role of setting goals and working towards achieving them. I am sure we all know some people who live in a fantasy world and they do not seem to adhere to the reality principle. Psychoanalysts attempt to bring these people back to reality by strengthening their Ego’s and pointing out to them the irrationality of their fantasies. In Jung’s model of the psyche, the Ego takes on a slightly different role. Jung’s Ego is the hero. The goal of Jungian psychology in terms of the Ego’s development is to strengthen the Ego through introspection and integration of the Shadow. And the journey to individuation is mythologically speaking all the trials and tribulations that the hero attempts and by fulfilling these tasks, the hero overcomes his own fears and weaknesses. Looking at the same example of the Lord of the Rings, the Jungian Ego is Frodo, who has to find the courage within himself to overcome his fears and desires to ultimately destroy the ring. The hero’s journey is fraught with obstacles and danger, designed to distract him from achieving his goal. He has find within himsef the courage to embrace the hero within or to become the hero depending on your perspective. If a patient enters analysis, the Analyst will strengthen the Ego through integrating their Shadow (well….hopefully :)). Through this process, projected Shadow content is made conscious and integrated into the Ego. The Ego then becomes progressively stronger and its ability to make choices and act upon them becomes greater. The process of individuation is a process of becoming ourselves. It is giving birth to who we are. Frodo is the archetypal “good guy”. He has no evil in him, or desires which cannot be met. He is content living amongst the hobbits. His journey starts here. But then, something new is introduced to him, a ring of power. The ring is a symbol of ultimate power, and to regain autonomy, Frodo has to destroy the ring which threatens to overpower him and control him. This metaphor describes how the unconscious complexes can take a hold of us and turn us into slaves to fulfill their own desires, not our own. Gollum is his shadow, that which he would become if he gave in to the power of the ring. He really struggles with this, seeing Gollum as his Shadow. Sam is not fooled, he can see the shadow clearly, but Frodo tries to find the good in Gollum. 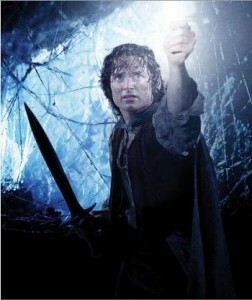 It is only when he accepts the darkness in Gollum as real and unwavering that he is able to let go of the ring. It is the process of exploring unconscious beliefs that tie us to a lifestyle and persona with which we have identified, but which we are not. All the monsters in the hero’s journey are the unconscious complexes which reside in our psyche’s and they have their own agenda’s. The light or fire that is used to dispel them are the tools of consciousness –illumination, reflection and assimilation. So, you can see that from a Western psychological perspective, the Ego performs a very important role. If the psyche is a vehicle, the Ego is the driver. Or another example, you can either be on the outside of the spinning wheel, going up and down and spinning out of control, or you can be the central axis of the wheel, being conscious of what is going on around you, but centered and in control. Individuation allows for the development of a bigger personality, becoming who you are in totality, a true individual who contributes their unique essence to the universe. Of course I am making it sound quite easy and in truth it is not. You will frequently find yourself spinning out of control, and sometimes you can reflect on it for years without a satisfactory outcome. But it is the hero’s journey, fraught with danger, disappointment and monsters. Interesting! I like your articles. Do you have specific advice to integrate the shadow? I’m rarely upset, maybe I’m too much in my comfort zone. I don’t know how to reach the shadow if not through emotions like aggression, irritation. How do I know if this absence of aggressive impulses and feelings are normal? The last time I felt resentment it was out of feeling oppressed. I painted the “oppressor” as irrational and felt strong aggression towards the person and I became quite passive aggressive before actually doing something about the situation. Only recently long after the situation I could reflect and realize that it was my own lack of standing up for myself that made me paint the “oppressor” as irrational. Is this a common type of projection? Perhaps I didn’t have enough knowledge to make this analyze at the time and that’s why it took so long before realizing my own silly behavior. What other ways can you face and integrate the shadow? And how do you find and integrate positive shadow aspects? Hi Erik. Yes you did it correctly. Projection works exactly like that, not only with people but objects, songs, brands, etc too. So it really becomes a mindfulness approach. Becoming aware of physical or emotional reactions will allow you to follow the thread and explore the projection. This is obviously true for both positive and negative projections.